Previous section: Course description and general notes. It is crucial that the instructor be familiar with these games prior to leading a class in discussing them! I found I could comfortably get by with refreshing my play-knowledge with a single session the evening before class. I found my friends usually quite willing to get together for a pick-up game of something in the name of game-studies education. After presenting a slideshow that introduced the course topic and summarized the syllabus (reading aloud the bits that I wanted especially to hammer home, such as the behavioral rules and disability stuff), I led an icebreaker where every student introduced themselves with their name, their major, their reason for enrolling in this course, and what they’re playing right now. I started off with myself, adding a quick rundown of my own credentials for teaching this course. This exercise surprises the students with the broad range of interests present – would-be physicists and programmers will find themselves sharing a table with business majors, artists, and the inevitable undecideds. The teacher should also make sure that the students realize that the question “What are you playing?” doesn’t only apply to videogames – students with favorite tabletop games, sports, or other play-activities under the wide umbrella of game should feel free to describe them. You can also take this opportunity to foreshadow the fact that the videogames you will study together won’t be limited to the latest and greatest – for example, when students told me (in September, 2011) “I’m playing Deus Ex,” I would ask “Which one?”, even though I knew perfectly well they meant the newest (third) one. Can’t Stop has very recently come back into print: here’s where you can buy it from FunAgain games. The game was out of print at the time of my class. I mocked up a version using homemade printouts of the board, a rules summary that I wrote myself, and lots and lots of colored wooden cubes purchased from FunAgain. This worked just fine in-class. Cosmic Wimpout is widely and inexpensively available, sold as an impulse-buy item at many game and hobby shops – I saw a few students bring in their own copies of the game for this week. I provided all tables with a printed adaptation of the game’s official rule sheet. Approximately zero students were aware of Can’t Stop before class, while a few had played Cosmic Wimpout before. Both games went over very well with the class, with many students voicing a strong preference for one game over the other. Discussion can center on comparing and contrasting the two games. Clearly, both games are about rolling dice and pressing your luck – choosing whether to keep your progress and pass, or be risky and roll again. But if that core mechanic is almost the same between the two games, why do they play out so differently? My inspiration to study Poker came from an excellent essay by Richard Garfield in the book Tabletop: Analog Game Design (ETC Press, 2011). He makes some great arguments about why Poker is interesting, and why it’s worth playing as a zero-sum tournament-style game, which allows for meaningful play without any real-money stakes. I recommend this book to all games-studies students or scholars, and certainly the Garfield essay to anyone adapting this guide. The book’s PDF version is a free download from the publisher. Each table received two packs of cards, a pile of chips, a summary of Poker rules I wrote, and a printout of the Lamarckian Poker rules page from The Cheapass Games Poker Suite. (The two packs allow for quicker play, so that the next hand’s dealer can get a head start on shuffling.) The in-class schedule is detailed on that week’s webpage. A slideshow I made for the class begins with a slide that reiterates the schedule and illustrates the chip values, as well as each player’s starting chip amounts. Between writing the week's webpage and making the slideshow, I lowered the value of players' starting chip-points to 90. This allowed each student to take 20 white chips, 10 blue chips and 10 red chips, matching the 2:1:1 ratio that white/red/blue chip-sets tend to come in. I also changed the word describing the chips' value from "Northeastern FunBux" to "points". Less humorous, but better at completely removing all suggestion of monetary worth from the picture. Be mindful of cultural resistance you might meet this week. I had one student ask to be excused from play because they were afraid that Poker ran against his religion. To them personally I proposed an alternate assignment of observing the game and writing a short essay about it, and at the same time wrote an email to the whole class clarifying that we would not be playing for real-money stakes. This student ended up withdrawing their objection in light of this information, and voluntarily stuck around after class to talk to me about the whole matter, where I learned as much about my own cultural assumptions as this student did about how Poker worked. We played the 1989 NES version of Tetris in-class, via an emulator on my Mac. I projected the game on the classroom’s big screen, and the students passed around a wireless Xbox controller keyed to the game. Each student got to play until they either went up a level, ended the game, or made an obviously bad move (creating a gap). As the students play, you can lead a discussion about Tetris. (You’ll have to weave around the audience’s cheers and moans, but it’s quite possible.) A great discussion starter is to ask who has played this game before, and on what systems. You’ll get a wide variety of responses. Then lead some speculation on why this game has stayed in print for all these years, getting re-implemented for new systems over and over, quite unlike most other videogames. If you do play the NES version in-class, you can also ask if anyone can name some rules that have been introduced to the “official” Tetris ruleset in the last 20 years. (Examples include the “ghost piece” that shows where the falling piece will land, instant drops, and the ability to hold a piece for later.) Lead speculation as to why these rules were added. After playing NES Tetris for a while, we played some web-based games that took Tetris as a point of inspiration: First-Person Tetris, and Tuper Tario Tros. You can pivot off these into discussion about why Tetris lends itself so well to spin-off projects like these. Shuffle the students, and have them play Blokus twice (with the same opponents); I believe I budgeted 40 minutes for this, but feel free to adjust this to taste. In debrief, compare and contrast the game with Tetris. What’s different about how players must approach the games, beyond the obvious fact that one’s a turn-based boardgame and one’s a real-time videogame? Lead some speculation on making a board game adaptation of Tetris. (Perhaps Blokus has done it already?) Afterwards, show this video, showing one player’s perspective of Reiner Knizia’s FiTS, which certainly comes pretty close to a direct (if wholly unlicensed) adaptation. Lead discussion on how that game works, judging by what the video shows. I also enjoyed showing this gameplay video of Blokus’ iPad adaptation (with the sound turned off, and skipping ahead to the 30-second mark) at the end of class. As it started playing, I told the students that the game has many angry, negative reviews in Apple’s App Store from fans of the board game, and challenged them to watch the video and see if they can guess what all those people were upset about. Having just played the board game, many of the students will light on the answer pretty quickly: the videogame version shows you all the legal placements for the pieces you’re holding! Finding these spots is such a large part of the board game’s challenge that taking this away, while well-intentioned, spoils the experience for many players. If the story is so linear, and more or less about the same series of events, why not write a short story or something? Why make this into a videogame, text-based or otherwise? Did anyone play as a lady, rather than a man? What happens when you do? How does this affect play experience? Allow students to compare the story structure with that of more well-known commercial videogames. Pretty much every modern single-player RPG with a zillion-dollar budget follows the exact same story pattern. You can discuss here how the medium of text can allow a creator to realize an interactive story much less expensively than otherwise. The game merrily goes along with all this (“OK, pants on fire now. Mm, Grunk like fire”), and the students usually go bananas here, barely able to believe it and excited to see what else the game lets you do. While interactive fiction can be hard for modern audiences to grasp when playing alone, they often become surprisingly accessible when a large group all plays a single game together, focused on the same screen. (Admittedly, it does help to have a teacher present who can nudge the group along when needed, especially at the very beginning when the entire text-only interface might be totally alien to every player present.) The Boston-based IF aficionado group I belong to has hosted several open-to-the-public text-adventure playthroughs at MIT and events like PAX East, and I based this course’s Lost Pig play on a similar pattern. I let the class pass this sheet around during our Wumpus play, and then pass it back up to me. When we started playing Lost Pig, I handed the keyboard to the first name on the Interactor list, and cued the first Reader to take it from the top. I would cue one role or the other to pass on every five minutes or so, depending upon on the number of volunteers for each. During debrief, ask the class what the strengths and weaknesses of this medium are. Strengths include the depth of interaction possible – in comparison, why doesn’t Skyrim let you burn up your pants, even though it contains both fire and pants? Weaknesses include the interface’s obscurity. But if it’s so obscure, why were games like this so hugely popular 30 years ago? Because you’re not me, you may wish to show my 10-minute video about modern interactive fiction, from which I spared my own class for reasons of common humilty. Ahem. Juxtaposing Donkey Kong and Limbo allows for some interesting discussion on the lineage and evolution of concepts within the videogame artform, since the two games are spaced 30 years apart but offer very similar verbs to the player (move up/down/left/right, and jump). They also have very fragile player-characters who “die” easily, but the way that “death” affects the player is very different. Why is this? “Which game is harder?” is also a very thorny question to ask the class! When necessary, I would request that a student pass the controller along before killing the character. This happened at least once when a Limbo expert confidently traipsed through several traps with perfect precognition, and another time when a student who had essentially never held a controller before had a great deal of difficulty moving at all. 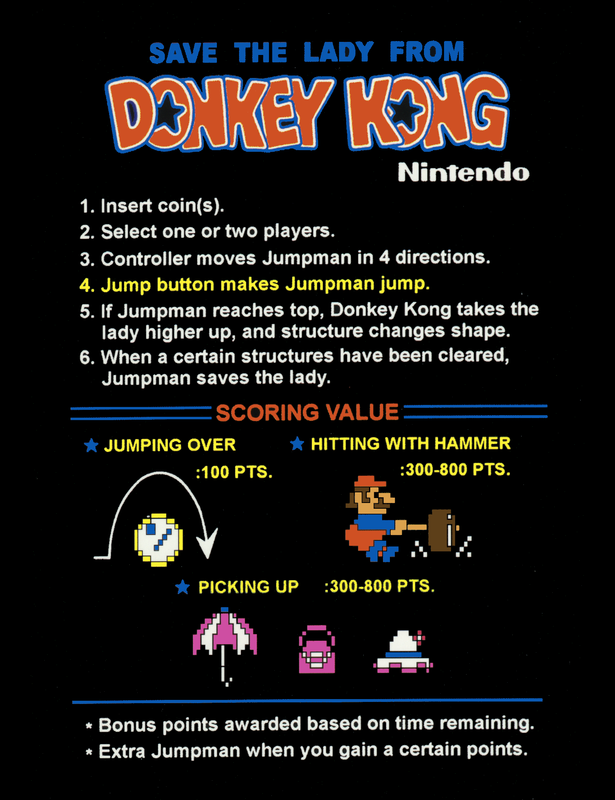 Additional classroom materials included this photograph of a Donkey Kong arcade cabinet, and two zoomed-in views of illustrations that were attached to every cabinet, under the screen: one game-instructions panel, and another one. We discussed what these artifacts could tell us about the expectations and assumptions that the game’s publishers had about players who were approaching the game machine. I attempted to teach the students about verbs, in the game-design sense, during our debrief — hence the a question about it on the quiz. I don't think I ever allotted enough time for it, though; students' answers usually failed to reflect what I wanted to see. They would offer attack, fall or die as verbs that Donkey Kong amd Limbo have in common, as opposed to move right or jump. It's very much a key game-studies concept, but it requires more time, and perhaps a wider variety of examples, to properly teach. At the top of the class, I covered the structure of the next three weeks, describing how the design exercise would work. Then I allowed a full hour or more to play Dominion; this minimizes the time left for debriefing, but I felt it a valid trade-off given that the class would continue to think about Dominion for the next two weeks. After setup, the game offers a lot of information for new players to absorb at once, so it may take half an hour or two before the game starts to click. As with most other in-class gameplay exercises, though, once one or two students at a table start to get it, they usually carry along the rest of the table, and things move smoothly from there. Making myself available for setup help and rules clarifications, I saw none of the 25 or so initial games of Dominion succumb to confusion. Direct students to play their first game with the “First Game” setup described in the rules. (This is the one with Militia, Moat, Market, and so on.) If they finish their game early, they can start a new one with any setup they wish, including a random one. If a table is left idle with not enough time left on the clock to start a new game, you can remind them that they will be a design team together next week, and they might like to start talking about card ideas now, or just browse the game's other cards together. Use the debrief time to wave your hands and announce that you have magically transformed the gameplay teams into game-design teams for the next two weeks. Remind the students to sit at the same tables when they return to class next week, and give them another run-down of how the next class meeting will work. No quiz this week. The students have enough work to do! Remind students that they should begin work with the same groups they played Dominion with, and let them reseat themselves as necessary. Continue using the table-numbering placards, so that the design teams can identify themselves as “Team 1”, “Team 2”, and so on. This will not just help team cohesion but also help you grade their work. Before class, you should prepare your Dominion sets to have ten “Custom 1” and ten “Custom 2” cards. You can either purchase blank Dominion cards from store.BoardGameGeek.com, or you can deface ten Copper and Silver cards from each box, writing “CUSTOM” on them in bold black Sharpie, and repurposing the “1” and “2” digits already found on them. In my class, we actually did both – I bought some blank cards, and spent an evening marking them up, but unfortunately they were stolen (along with everything else in my bag, alas) while I ate lunch before the first Week 8 class. With no time to order more blanks, I directed the students to transform some of the Treasure cards into Custom cards, as described above. They returned these marked cards to a separate slot in the box for subsequent classes to use; it worked fine. This is the week when teams will playtest and critique each others’ Dominion cards. Prepare for class by figuring out which cards to give which tables. Ideally, each table will receive the card-sheets of a table that isn't its immediate physical neighbor, which allows the testers to discuss the new cards out of earshot of their designers. At the start of class, make sure once again that everyone’s at their proper table, and then review the rules. Announce that you’ll give each table the one or two cards that another team created. They must play at least one game of Dominion involving these cards, making an effort to purchase and use them in-game. While playing, they should discuss how well the cards are working, and at the end of play they should write critiques of the cards in the space provided on the worksheet. Make sure that everyone understands the rule that the playtesters cannot ask questions of the designers during this phase! You can use this opportunity to touch on the fact that this is how playtesting works in the real world, both with tabletop games and videogames. It’s meant to be a simulation of a customer playing this game, without the benefit of the designer looking over their shoulder. Pass out the worksheets after you’ve gone over all these rules; I found that passing out the sheets first provided far too much of a distraction to the students, who were eager to tear into the new content (regardless of the fact that it was created two tables away from them). As it approaches wrap-up time, remind the class that it’s time to start writing their critiques, if they haven’t already. Also remind the students to write their names on the worksheet – this is how you’ll know who actually showed up today (unless you’ve been taking attendance some other way). The most popular type of student-designed card, by far, was Attack cards, of which the base Dominion set has only a few examples. Students enjoyed filling in this pereceived gap by inventing all manner of ways to foil one's opponents, often quite chaotically. I was just fine with this: the following week, the playtesters had no trouble revealing the balance problems these cards could quite easily introduce. After the exercise ended, I referred students to this thread about Dominion card design on dominionstrategy.com. I discovered the thread just as the exercise was gearing up, but despite its relevance I opted to not burden the students with all that information at the outset. Better to let them have a fun and enlightening time discovering these mistakes for themselves, I figured. Due to both time constraints and the advice of a colleague, I dropped Pandemic in favor of Forbidden Island, a similar, faster-playing game from the same designer. It’s too bad because Pandemic has a much richer theme and (in my opinion) more compelling gameplay, but in the end it was good to have a solid co-operative tabletop title that took only half a class period to play once or twice. Note the instruction to students, towards the end of the week’s webpage, to email me if they’d like to volunteer to play Left 4 Dead in-class. I figured that this would make it easier to choose who got the play the game in-class (with everyone else watching), but it worked too well: every section produced only two or three volunteers emailing me ahead of time, and I had to wing it to produce a one or two more in each. Before we played the videogame, I instructed all the non-playing students to act like they were at a movie: feel free to react to the on-screen events, but please don’t call out warnings or advice to the players. The point of this exercise is to see how they work together (or not) to win (or lose) the level. We played Left 4 Dead by connecting two Xboxes together, with two players logged into each one, playing in split-screen. (This is the minimum amount of equipment you need to play this game with four players, locally.) One Xbox sent its video output to the classroom’s big screen, and the other to a television that I had dropped off ahead of time by the university’s A/V gnomes. Playing through one of an L4D campaign’s middle chapters takes around 15 minutes; if players aced it, I let them start the next chapter, but called it for time after another 10 minutes or so. FAQ: I chose to hold up the original Left 4 Dead and not its sequel because it has a simpler ruleset. After playing both games, we debriefed about the different approaches to cooperation that the two games took. I liked to lead the discussion to contrast Forbidden Island’s player-specific powers versus L4D’s completely equivalent characters, asking why either game took that approach, and to ask how Forbidden Island, lacking a CPU and the reactive enemy-spawning system that L4D has, can still generate tense moments and a sense of antagonism just by flipping cards over. In class, we began by playing and discussing Every Day the Same Dream (also by Molleindustria). I asked for a volunteer to steer the guy around, but would do it myself if nobody came forward; the students would get into the game and start calling out suggestions soon enough, in any case. Then we’d debrief for a while on the game’s meaning and medium (e.g. Why make this a game instead of an non-interactive animated cartoon?) before moving on to a Passage playthrough. I discovered only the day before the first class of this week that Roher’s Passage did not run at all on Mac OS 10.7 (Lion) or later, and I didn’t have an emulated Windows environment installed on my laptop. We ended up playing it on my iPad, using an iPad-to-VGA to project it onto the big screen, but then had to settle for playing it sideways since that edition of the game doesn’t support screen rotation. So, keep all this in mind and prepare accordingly. Unfortunately, I found Galatea not a good fit for this week, at least not as a homework assignment. Despite our earlier play-through of Lost Pig, students playing this older IF game at home reported only confusion and frustration with the interface, and reacted with grumpy boredom when I led an in-class playthrough. I dropped discussion of it after the first section, though students could still address it in their answer to that week’s quiz if they wished (and a handful did). We wrapped with a McDonald’s Videogame playthrough, with one volunteer student playing while everyone else was free to call out advice. Followed that with a debrief about the game’s agenda, its effectiveness, and once again speculation as to why its creators chose the medium of a videogame as opposed to something else. I was surprised and delighted that several students made cogent arguments about how the game made them feel sympathy for McDonald’s! As a time-fill to replace Galatea in latter sections, we played I Fell in Love with the Majesty of Colors, which, while quite accessible, wasn’t the strongest example of an “art game” I could have chosen. Due to the way Northeastern’s academic calendar combined with the lab’s three-section division, this week ended up being an ungraded, optional-attendance freebie during my semester. I made this fact clear to the students in email, but promised something interesting for those who did show up. Around a third of the students of each section did end up rolling in, which as it happened made for just enough people to play Werewolf. As I wrote on my game blog, I was surprised to learn that most of the students in one section seemed to be quite familiar with this game – but it was entirely new to the students of another. After a few rounds of that, we played Action Castle, another party game. Both these activities make for a fun and upbeat note to end the semester on. Because it was tangential to the topic of games for larger groups of people, I also snuck in a screening of my video about Diplomacy.